With summer on the way you might be planning a trip to Australia’s Gold Coast, and already checking out the holiday specials. And if you are, that’s a smart choice, as you can be sure of having an amazing time. Gold Coast holiday rentals have been popular for years, providing freedom and flexibility to do whatever you please. While hotels sound luxurious, the truth of it is that you can often find yourself cramped into a small room with little privacy. When you rent your own holiday apartment, you’ll have space, security, freedom and privacy, not to mention all those great benefits, such as fully equipped kitchens and Austar. There are lots of reasons why you might be planning a trip to the Gold Coast – perhaps it’s the theme parks and the beaches, or the lush hinterland with its walks and waterfalls. Or maybe you want to indulge your inner gourmet by experiencing some of the best cuisine in Australia! Whatever you like doing, it’s even more enjoyable if you’ve been able to pick up a great Gold Coast holiday special and save money. Some of the most popular Gold Coast holiday rentals are in Broadbeach, a beautiful suburb that not only offers two patrolled beaches, but also a wonderful network of waterways. Set amongst the pretty parks, restaurants and cafes, you’ll find a great selection of top quality resorts, including the benchmark-setting Phoenician Resort. 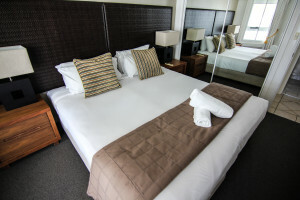 This AAA 4-Star resort regularly offers Gold Coast holiday specials – just take a look at their website! You’ll discover excellent accommodation at the Phoenician, with luxury, air-conditioned one and two-bedroom apartments.The two-bedroom apartment comes with the bonus of a second bathroom, while all apartments include additional double sofa beds. These apartments are more like small homes, with fully equipped kitchens and private laundry facilities, as well as spacious living areas and private balconies. And unlike some Gold Coast hotels and motels, you’ll find the best quality fixtures and fittings, with impressive attention to detail throughout. The Phoenician’s facilities certainly live up to the quality of the accommodation, with two swimming pools – one indoors, spas, sauna, gym, games room, barbecue areas, tour desk and secure underground parking, all just 100m from the patrolled beach. While peaceful and private within the resort, you are just footsteps away from everything you need, including the famous restaurant precinct and the amazing Jupiter’s Casino, where you can dine and enjoy world class shows. It’s the perfect opportunity to also try some new experiences, perhaps hiring a boat, or booking a surf lesson. Or maybe it’s the Gold Coast’s many great events that has attracted you. Due to the region’s fantastic climate, events take place all year round, with something for everyone, from major sports competitions to music festivals. Coming up is the Broadbeach Jazz Weekend in August, the Swell Sculpture Festival in September, and the Gatorade Queensland Tri Series in October. Or perhaps you’re planning a Christmas getaway! If so, you should be booking soon, or you risk missing out at this busy time of year.